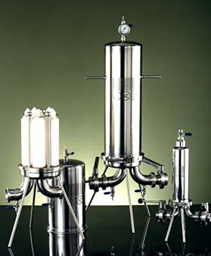 The PNA series filter housings are specifically designed for sterile filtration in food & beverage applications. The PNA series are available in a variety of sizes ranging from one cartridge of 10″ length up to 8 cartridges of 30″ length. In-out connections are sanitary type DIN 11851. All the connections for optional accessories ( gauges, valves, viewers, etc ) are threaded ( if tri-Clover connections are required, refer to PNB series). The standard vessel closure is V-clamp.